You’ll frequently hear Bob Nelson and David Moore talk about just how short a time period 45 days is. Here they cover the importance of controlling transactions while that clock is running. David Moore: Hello, David Moore with Bob Nelson of Pacwest Real Estate once again. Thank you for joining us! Today we’re going to talk a little bit about controlling transactions and the importance of that 45 days, huh, Bob? David Moore: I don’t think there’s a more important period of time in an exchange, the 180 is problematic at times but the 45 is always an issue for everyone. For those out there, there’s no extending that 45 days short of a national disaster so don’t plan on having an extension there just because you want to extend it. We’re in a tight market, we’re having things get stretched out. And we are in a situation where you cannot extend that 45 days for any reason. I guess what I’ll tell my clients is that it’s critical that you are all in or all out on day 45, because if you are not totally committed and you come to me on day 50 and say, “Gee, the properties I identified went away, I want my money.” That’s a whole other conversation because bottom line… you’re not going to get it until day 181 and that’s not our company’s policy it’s, unfortunately, part of the G 6 rules of 1031. With that said, in a market like we’re in Bob, what are you doing with your clients to minimize the importance of that 45 day time period, or to control properties that have been identified? 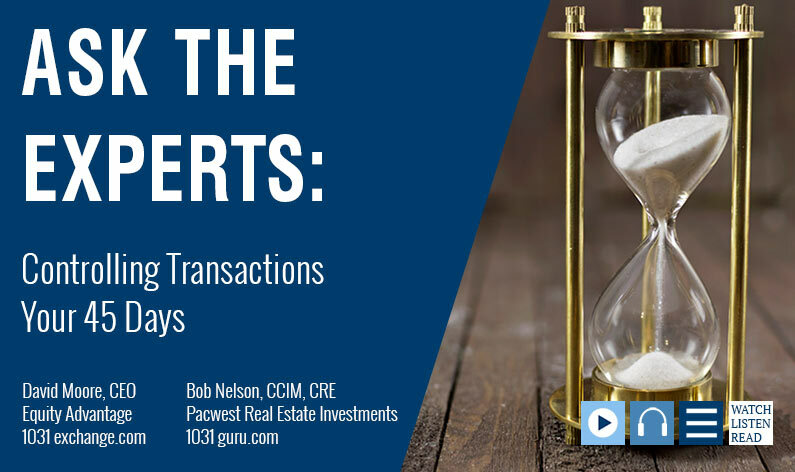 Bob Nelson:Those are two different subjects, but I like to work with a person at least two months in advance of the time that we sell the property we’re going to be exchanging proceeds for into the replacement property. If we have this opportunity to get together, give me an opportunity to see things through your eyes, and to understand what you’re trying to accomplish with this transaction. Then as the hammer falls, as you sell our relinquished property, the 45 day period starts. David Moore: I don’t care if you cross state lines, he knows. Bob Nelson: It’s just me. David Moore: Actually, for my friend, Bob, we want you to not pass state lines. Bob Nelson: It makes it a little more difficult and sometimes a lot more difficult. But if we could stick with properties that are listed for sale, look at anything that you would like, I’m going to be feeding you properties every day. Every day you’re going to be receiving properties that seem to have the benefits that you indicated that you were after. You have the right, of course, as my client to eliminate anything, you just have to tell me why you’ve eliminated it so I can do a correction, two clicks to the left and one to up and now we’re producing a different property that you would consider. But at the end of that two-week period, we have to be making offers on the very best property that has met your criteria, the one you selected that you would go with. That’s not to infer that I’m going to let you get away with only identifying one thing. If we’ve got three chambers in the gun, we’re going to have three bullets in that thing when the 45th day hits. But if you say, “This is the one I want. This would satisfy my exchange.” That’s fine. At the end of the second week, we’ll be making offers. It may take me a week with counteroffers, with other maneuvers to control the property, but by the end of about the third week, I need to be bringing in the due diligence crew to evaluate the property to make sure it’s as was represented and frequently it’s not. Whoever is bringing, the broker who’s bringing the thing in likes to tell me about next year’s income and half of last year’s expenses, and that’s why the cap rate is such and such, and I get to the bottom of that quickly. I want to see copies of leases, and I want to do a walk through on the property. Yes, that’s going to disrupt the tenants, and the owner of the property doesn’t like that to happen but they will see that we’re very serious and we understand what we’re doing, and we will have our due diligence out of the way by the fourth week. You will have been prequalified by a lender and the lender will have the appraisal ordered, and will have a pretty good hint that we will not have problems with the appraisal hitting the number that was needed in order to get the loan that we need to replace debt if that’s our objective, or to create debt on the next property. If you’ll do this, there’s a pretty good chance that we know we can close within that 45-day period. That is an absolute fire drill. But if it’s done just right, it can be accomplished. The only requirement you have is to write on a piece of paper if you’re using the three property rule, write on the piece of paper what those three properties are, hand them to David, and that’s all that’s required by the code. What happens on the 46th day if they all go away? Guess what? You get to pay the tax. I don’t like to see an opportunity for that to happen because people will remember that I failed in doing my job and I never want to fail. Bob Nelson: But they’ll be throwing rocks at me. David Moore: And now it’s day 50, those properties went away and now they want their money back and once again I’m stuck. Bob Nelson: So you’ve got to control them, you’ve got to do the due diligence, and you have to know exactly, yes, I will take this property. I know its physical condition, I’ve reviewed the leases, and I understand what the position of each of the tenants would be that this generating the income that causes the return that impressed me to go after it to begin with. But if it’s done just right, you’ve eliminated a lot of the risk. Did I say we’ve eliminated all the risk? Heavens no. Things can go wrong, stuff just happens. But if you perceive all of the opportunities of failure and you have encountered or put together a plan that would eliminate the majority of those things, at least we’ve got a running chance of 100% success, and that’s what I’m after, 100%. David Moore: Definitely, we want happy successful investors. David Moore: And we’ll speak again very quickly. Bob Nelson: Thank you very much. David Moore: Thank you very much. There’s just too much at stake to handle it by yourself; besides, 1031 exchanges are pretty complicated. Put an expert on your side, call Bob Nelson today!